Firefox Share is a browser extension that allows you to share links in a fast and fun way. Share links from within the browser, from any webpage, using the same services you already know and love. 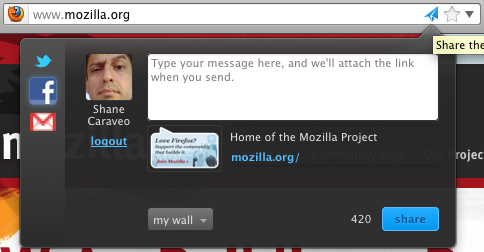 Firefox Share is made by Mozilla Labs. Firefox Share derives directly from the F1 , the old extension of Mozilla Firefox for the same purpose. The main difference is in the background, while the F1 connects to Mozilla’s servers, and from there, access to social networks, the Firefox Share this intermediate cuts and communicates directly with Facebook, Twitter and Google / Gmail – the three services supported by now. We’re pleased to introduce the Firefox Share alpha add-on, a spinoff from the F1 add-on you may already be using. Firefox Share is a descendant of F1, but it differs in a few significant ways that we’ll describe below. We’d love for you to try it and send us feedback to improve it. The F1 was made the way it was because it was easier and faster. I just think weird not having kept the name, both extensions, although profound differences, in the end do the same thing. Since this alpha has been focused primarily on the re-architecture, they had to drop a couple of features, including support for LinkedIn, Google Apps, Yahoo, and multiple accounts per service and so on. So guys, do you know any better firefox extension which is lighter and faster to share content? If yes, share it in the comments.